The comments made by followers of Cody’s blog, my friends from Great Lakes Border Collie Rescue (GLBCR), and Facebook friends have been emotional, supportive and loving. 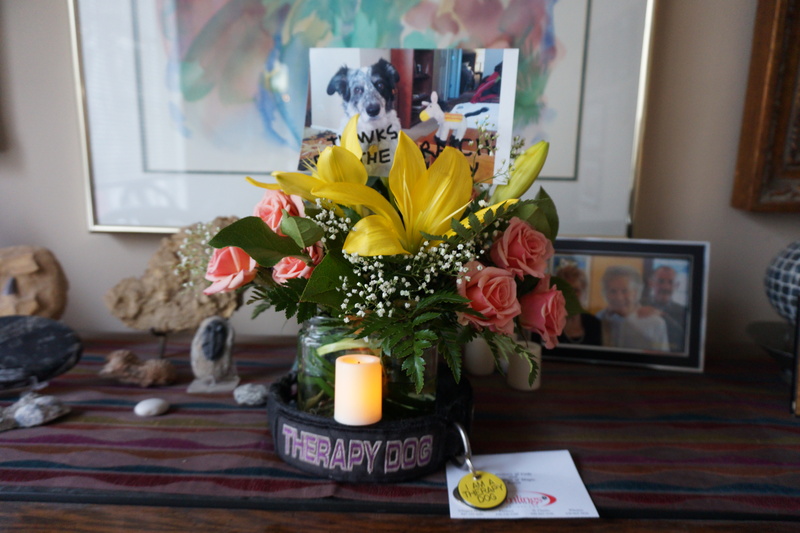 One of my very good soccer referee friends sent me flowers and with Cody’s collar and picture, I have a makeshift memorial. It does provide comfort and Magic is very interested in the smell of the flowers. 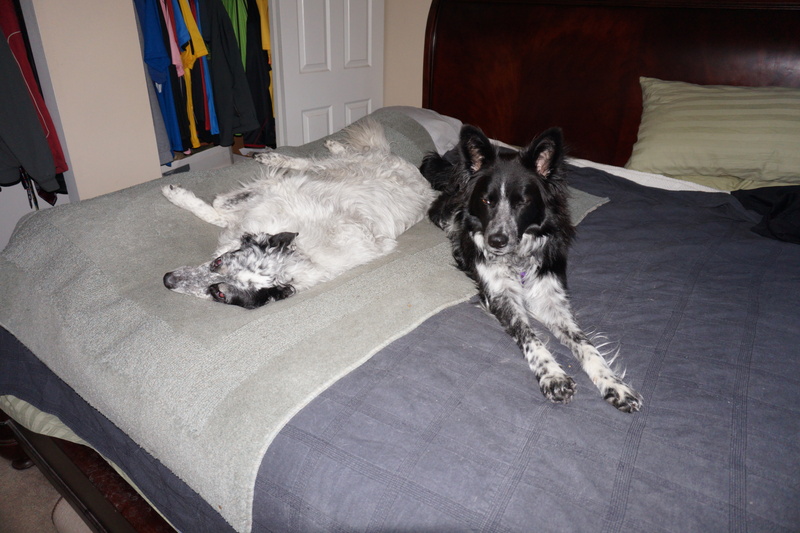 As all of you know, four weeks ago, I adopted a young male Border Collie from GLBCR whose new name is MAGIC. While the higher-ups at at GLBCR were fully aware that I was interested in adopting another Border Collie, they were also fully aware that my next Border Collie would be a working Therapy Dog. An appropriate Border Collie (ASH) that was available in the summer became unavailable because that Border Collie had worked his ‘magic’ on the man who was baby-sitting him for five days. The baby-sitter became the adopter – a happy ending for the dog, ASH, and for GLBCR. In September, sometime, a young male Border Collie was picked up as a stray by the Adams County (Quincy, IL) Humane Society. GLBCR was contacted by Adams County and this young boy was rescued by GLBCR and transported to Crown Point, IN to be fostered by Kathy P., a foster-mom in Crown Point, IN. Kathy P. recognized this dog’s personality and potential and contacted me. I met this dog on Saturday, 22 November and immediately fell in love with him, as does everyone who meets him. So, a stray in Quincy, IL ends up with Tom and Cody…what are the odds? The passing of Cody, my full time companion for 11 years, has been an emotional trauma. Without this young Border Collie, MAGIC, fostered by Kathy P., I’d be in serious trouble. Great Lakes Border Collie Rescue is one of hundreds of organizations dedicated to rescuing and re-homing dogs. I applaud the organization, their amazing volunteers, and their mission…AMAZING PEOPLE ALL! Thank you for finding another Border Collie for me! Magic and Cody the day before Cody crossed the bridge. They were becoming very good friends and sleeping partners. This entry was tagged border collie, border collie rescue, Crossing the bridge, death of a pet, dog rescue, dogs, dogs and people, herding dogs, life with dogs. Bookmark the permalink. Tom, there is a beautiful order to the universe, I believe, for genuinely good souls. Just as Cody was meant to travel a long and glorious path with you, so is Magic, and so it was that he came into your life at precisely the right time. I remember hearing about how easily Cody accepted him, and everyone at GLBCR was just so thrilled that Kathy P. was able to make this match for one of our most favorite adopters. 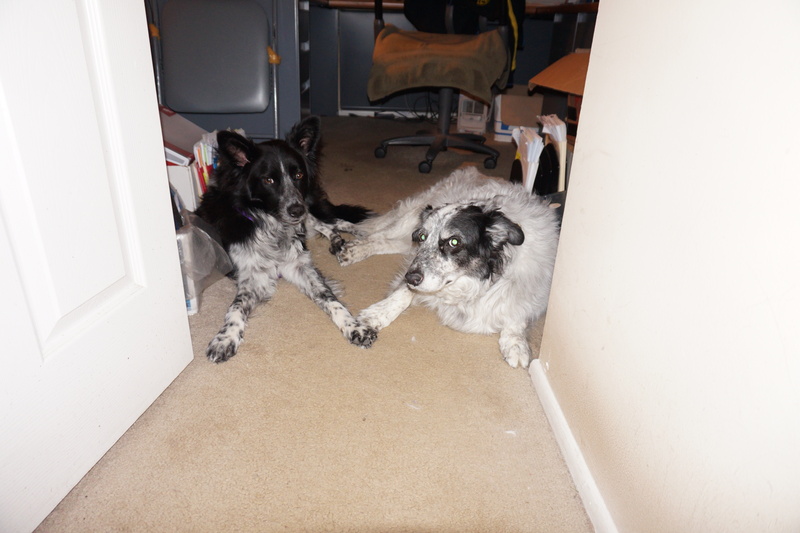 When I looked at the photo you shared today of Magic and Cody facing you together, I enlarged it and saw that the boys’ paws were touching. That hit me powerfully. I personally believe that Cody will be along on all of the adventures you and Magic are about to share, no less real because he is on silent paws. Think of him as just being around the next bend on the path. It is so hard to see a great friend leave your side. I didn’t know you or Cody for very long, however he wiggled into my heart! I’m glad to hear Magic will be writing some posts. I love reading about border collie thoughts. I am so very, very sorry to hear about the passing of your beloved Cody. I lost the Love of my Life, Bossdin, on Christmas Eve. You are in my thoughts. I’m sorry for your loss. I understand your pain. Godspeed, Cody. Best wishes for the newest member to your family.